Dates are high in Natural sugars like glucose, fructose, and sucrose. The high energy present in dates can be attributed to this high sugar content. Here in this article, we are talking about dates and benefits of dates for men, women, and kids. Today, dates are grown all over the world. Dates are sweet fruits of date palm tree scientifically known as Phoenix dactylifera. They are one of the best versatile foods that can regulate the digestive process and have gained popularity in recent times. Date palm trees are cultivated all over the world and especially across tropical regions. You can also use date molasses in your smoothies or desserts as a sweetener, because they are so sweet, as in my Dates Chutney recipe, I used only half spoon of Jaggery Powder. Rich in various nutrients, fiber, and antioxidants, dates are popular throughout the world and are consumed as a dry-fruit. My husband and sons, love Dates and eat after dinner. I like to use Dates in my Banana milk Shake. Depending on the variety, fresh dates are fairly small in size and range in color from bright Red to bright Yellow. This article will discuss some health benefits of eating dates and how to incorporate them into your daily diet. For this reason, dates are very sweet and also have a subtle caramel-like taste. They make a great healthy substitute for white sugar in recipes due to the nutrients, fiber and antioxidants that they provide. Dates are comprised of a large proportion of simple sugars, being mainly in the form of Glucose and fructose, which are used heavily for energy by the body. Consuming a few dates prior to exercise ensures that your brain and muscles have enough energy to perform at a high intensity. 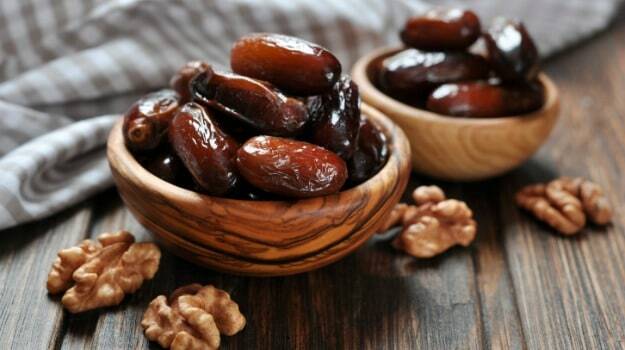 Dates are also convenient to keep if you are a diabetic, as their sugars are rapidly absorbed into the blood for use in the case of an event where your blood sugar drops too low, too fast. They should not be consumed frequently if you struggle to keep your blood sugar under control, as their generous carbohydrate content can add to your diabetes woes. Bone health: Dates contain several minerals, including phosphorus, potassium, calcium and magnesium. Blood sugar control: Dates have the potential to help with blood sugar regulation due to their low glycemic index, fiber and antioxidants. Thus, eating them may benefit diabetes management. According to USDA dates are rich in sugar along with proteins, and many other essential vitamins are a good addition to your diet. How to Make Dates or Khajur Chutney? Recipes with More Dot Com(https://www.recipeswithmore.com/) is for everyone, because from here you can Buy a lot of Cheap Stuff for Home Decor, Buy Babies Stuff on very Affordable Prices and much much more.............. You can Create a Stunning WordPress Website with SiteGround Hosting by using my Affiliate Link and Make Money with your own Website.Not only this, you can also learn to Cook by watching Recipe Articles with Videos or Watch my YouTube Channel-https://www.youtube.com/channel/UCxoEbTnY-cOLHpyMlkb2VNgThanks for your Support, Author of this Blog Jaswinder Kaur.